We all know that Coffee is one of those drinks that some people can’t do without. Some of us are just satisfied to get a cup from the coffee machine the moment we get to the kitchen, while others are always on the lookout for that perfectly brewed coffee that stays hot for hours. This brings us to our discussion on a coffee machine. The Cuisinart DCC-3200 to be specific. DC 3200 is the best grind and brew. It begins as a food processor then they create a coffee maker that all of us would love to use. It is one of the most famous companies which have specialization in manufacturing various household appliances. This coffee maker brings comfort and convenience to the lives of people. It is easy to use that even a beginner can immediately use this product compared to other coffee makers. 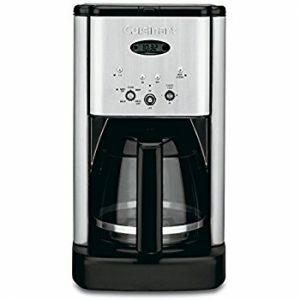 One coffee maker that has excellent feedback was the Cuisinart DCC 3200. These features include a 24-hour timer, zero to four-hour auto-shutoff, 2 brews strength setting for bold or regular and settings for 1-4 cup quantities. There is also an alert tone that can be easily silenced if you don’t want the machine making more noises than it has to. It is equipped with cutting-edge coffee technology to give you hotter coffee without sacrificing taste. Additionally, this 14 cup coffee machine allows you to select Regular or Bold coffee flavor Fully Automatic with 24-hour programmability. Some of its other amazing features include 14 cup glass carafe, gold-tone permanent filter, BPA free design, brew pause feature and 1-4 cup setting which enables you to choose how much you want to brew. 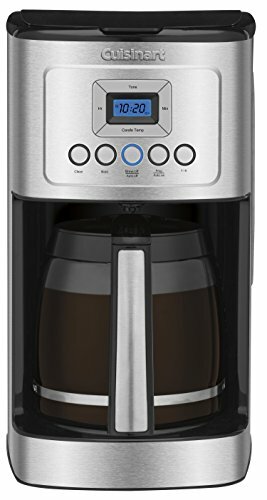 Reviewers have given this coffee maker high mark all across the board with others stating that they purposely purchased this machine for its numerous features and its ability to produce high-quality coffee. It is a fairly simple coffee maker despite its whistles and bells. In fact, all the coffee makers under the Cuisinart DCC line perform fairly well in this regard. Some users have criticized its controls stating that they are a bit tricky to figure out. Other reviews don’t seem to have any issue with the controls though, in fact, some have praised its intuitive buttons. The display of backlit LCD is easy to read, large, and clearly visible which in turn makes it easy to program. The water reservoir which is located at the top of the machine has however received some criticism with some reviewers stating that the carafe leaks water particularly when they are pouring it in. The Cuisinart DCC tone can be turned on or off and has an indicator light signal when it’s time to decalcify. Cuisinart DCC-3200 oozes class in every part and section of the machine. It is pretty tall, approximately 17 inches. Some users have criticized this, stating that they are not able to place it in the location they prefer since it does not fit in their cupboards. However, despite its height, it also boasts of a rather small footprint for a multi-featured drip coffee machine and has been praised for its small size which makes it occupy small space on the countertop as compared to other coffee makers. Cuisinart DCC-3200 is made of stainless steel that appears light black in color. In terms of performance, Cuisinart DCC 3200 is rated excellent and has been proven to meet the standard brewing temperature of 1950 – 2050 Fahrenheit for 5 to 6 minutes. It Ensures hotter coffee temperature without sacrificing flavor or quality Brew Strength Control. Most owners of this model have commended this feature, particularly those who love their coffee served hot. It has also been lauded for sweet tasting coffee it produces. It also rated highly for its quickness with cutting-edge coffee technology in brewing a full pot of coffee which give you hotter coffee without sacrificing taste. “Bought this to replace a 5-6-year-old Krups unit with flaky electronics and a rusty hot plate. This thing runs circles around the Krups. Makes great coffee and looks nice on the counter. It does have a considerably bigger footprint though. Don’t expect to put this under a wall cabinet and have room to open the lid. This Cuisinart DCC-3200 model offers good value for money especially when it comes to price to features ratio. Gold-tone permanent filters, programmable timers and settings, fully automated and the list of good things goes on and on with only a few drawbacks. This is one of the best coffee makers on the market for a modern kitchen. I would definitely recommend it to anyone looking for a coffee maker equipped with a cutting-edge coffee technology.